For the forthcoming month of June one of the most alluring music events of the year will take place once again at Jazz Café. 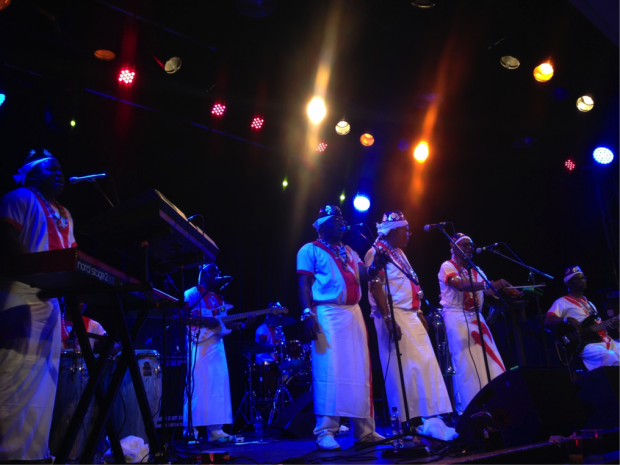 It is a chance to see two incredible acts entwining threads of music legacies; incomparable groove and afro-funk perfectionism are the forces opening the doors on the evening of the 15th June, and the journey is going to beam us up. The world-wide voodoo sire T. P. Orchestre Poly-Rhythmo carves the Tout-Puissant (all-powerful) rhythms, crossing strands of afrobeat, funk and soul music. It’s truly all-mighty. During the times of Benin’s pre-independence and post-independence, the Orchestre’s members elaborated on Benin’s voodoo beliefs that music evoked local spirits and initiated phenomena of collective blissful rites. They now celebrate 50 years together, and their performance is bound to showcase instrumental transportations, as well as rich and wide vocal dialogues. London based groove-tailor project Minyanta will bring a truly special interplay with its quintet elements; electric bass lines and synth driven rays entailing kora and balafon cool breezes have already seduced Koko – it’s no wonder they are now touring European summer festivals. In short, this is an opportunity to enjoy the wonder of a curious relationship between one of Africa’s veteran orchestras and a three-year-old intuitive quintet who sew together cultural legacies using music rulers for knitting sticks.